The R&S®SMW-K502 wideband extended sequencing option can be used together with the R&S®Pulse Sequencer Software and its options R&S®SMW-K300 and R&S®SMW-K301. 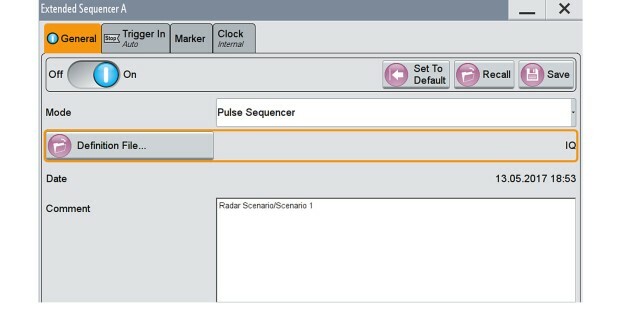 The R&S®Pulse Sequencer Software Software calculates all required signals and required sequencing lists and transfers them to the signal generator. The R&S®SMW-K502 wideband extended sequencing option can be used together with the R&S®Pulse Sequencer Software and its options R&S®SMW-K300 and R&S®SMW-K301. The R&S®Pulse Sequencer Software Software calculates all required signals and required sequencing lists and transfers them to the signal generator. Continuous wave signals, unmodulated rectangular CW pulses and pulses with linear frequency modulation or Barker codes are calculated in realtime inside the R&S®SMW200A. Also pre-calculated waveform segments can be used with these sequencing lists. Changes of amplitude, offset frequency, pulse width, offset phase and off time are always applied in realtime as defined by the sequencing list. The start time of the signal generation process is defined by a relative time stamp with time of arrival (ToA) information. Memory requirements are reduced to a minimum and playtime is increased enormously. Sequencing file rectangular pulses, unmodulated, variable amplitude, 5 ms PRI 187 kbyte/min. Time with R&S®SMW-B9 option 417 ps.